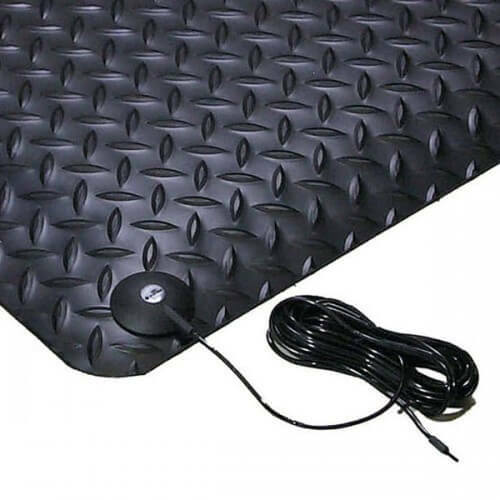 The 9/16" Diamond Stat™ is a conductive/anti-static mat designed to absorb static electricity. 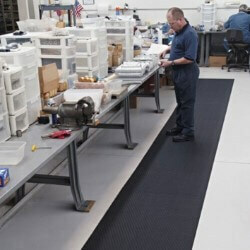 The mat drains static electricity from the worker keeping sensitive circuitry from being damaged. The durable vinyl diamond-plate design provides non-directional traction, and is easy to clean. The top surface is combined with a dense closed cell foam base utilizing NoTrax® exclusive UniFusion™ technology virtually eliminating the possibility of de-lamination. Production time: 3 to 5 business days. Custom Sizes and Runners Available - Up to 75' in length in 3' widths. For pricing and ordering information email or call us. 1. 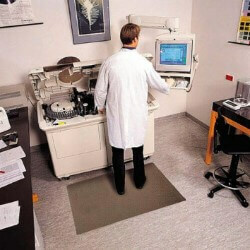 Dissipative /anti-static mats are formulated to absorb static electricity. 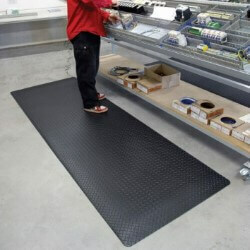 This mat drains static from worker keeping sensitive circuitry safe from damage. 3. Sloped beveled foam on all 4 undersides affords easy access onto and off of mat. Overall mat thickness is 9/16 inch.